Enjoy hassle free, great espresso coffee, every time! We will repair any problem within 24 hours or replace the machine. All machines are installed and programmed by our staff. Onsite training is provided to your staff. All machines are cleaned, sterilized and maintained on a regular basis (250 beverages or fortnightly, whichever occurs earlier). 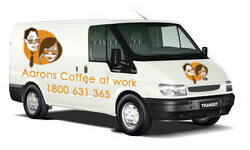 Coffee and other products are delivered direct to your office on order. Its easy to order. Just free call 1800 631 365 and we’ll get you started. How to Make a Great Coffee!